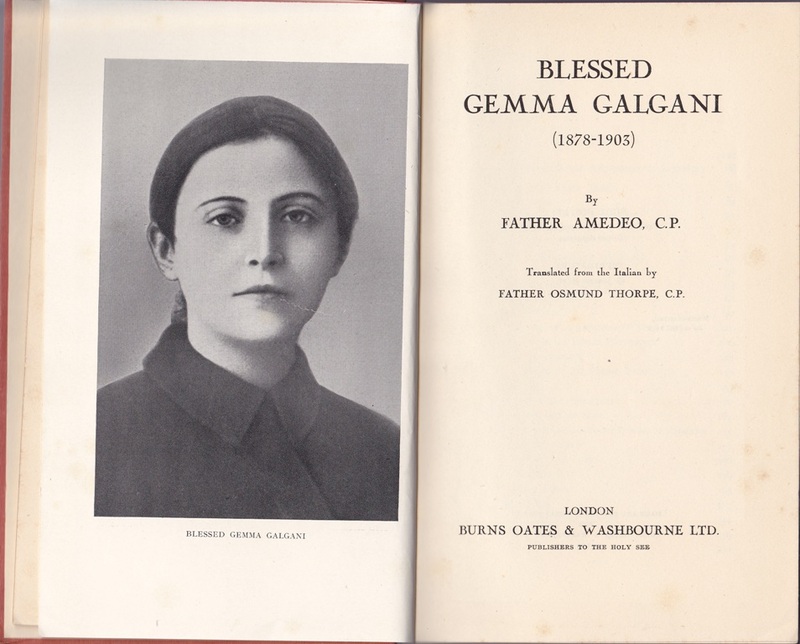 Stories from "Blessed Gemma Galgani"
Thanks to holy card and medal purchases and donations to this website I was able to acquire from a used bookseller in Great Britain a very rare book entitled “Blessed Gemma Galgani” by Father Amedeo, C.P., 1935, published by Burns, Oates and Washbourne, and translated by Father Osmund Thorpe C.P. This book was quite popular in Italian, but the English translation is very rare, so I was delighted to be able to find a copy after several years of searching. And, I am delighted so far with the additional information in this book about Gemma that is not on this website and that I have not read elsewhere. 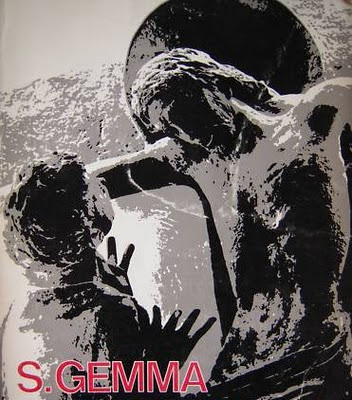 So, God willing, I am hoping to add a few new articles to this website from this book, but for now here below are a few interesting stories about Gemma’s childhood from the beginning section of this book. At the beginning of the book we read “The child (Gemma) was baptized the day after her birth by Don (Father) Peter Quilici, parish priest of Camigliano. There had been a disagreement in the family about the name she should be given. A paternal uncle, a captain of the army medical staff, wished her to be called Gemma. Her mother objected. The parish priest of Gragano, Don Olivo Dinelli, was asked to settle the question. Aurelia explained to him why she was reluctant to agree to her brother-in-law's suggestion. 'How can the child get to heaven,' she asked, 'if there is no saint of the name of Gemma?' 'But,' replied the priest, 'there are gems in heaven, and let us hope that she may become a gem of Paradise.' So it was agreed to give the child the auspicious name of Gemma, to which were added Maria Umberta Pia. 'When she was about four she came to our home at Porcari for a few days to enjoy the country air. My mother, in whose room Gemma slept in a little bed by herself, found her there one day on her knees, with hands joined, before a picture of the Heart of Mary. She called my brother, the army doctor, saying: "Come and see how Gemma prays," and together they watched her. "What are you doing, Gemma?" asked my brother. Gemma answered: "Go away, please; I am saying the Hail Mary." As they left my brother said: "If I had a camera I would have taken her photograph!" The evidence of the Vallini sisters completes the picture of Gemma and her family, given by Elisa Galgani and Isabella Bastiani. As the years rolled by, however, Gemma made such progress in virtue that even before she left school she had acquired almost complete self-mastery. Whatever was artificial or forced in her manners or conduct disappeared, and virtue seemed to become a second nature. With a heart already so united to God, it is not surprising that Gemma was remarkable for the way in which she attended to the altars in the Chapel and classrooms, devoting her time to keeping them clean and becomingly decorated, nor is it surprising to know that she had no interest in the amusements which delight other children. But already in these early years Gemma's zeal for the spiritual welfare of her neighbour was noticeable. She listened with particular interest when the Sister read to the pupils in school the Annals of the Foreign Missions. Although Gemma did not enter for the public examinations, because it was not customary at her school, she did well at the examinations which were held by a visiting professor. According to her teacher, she attained a high degree of proficiency in literature, science and mathematics. But it was in the knowledge of her religion, the catechism, the Bible and ecclesiastical history, that she shone conspicuously. In a competition amongst the children of the city she won the gold medal for Christian Doctrine. This success elated her father, who thought of sending her later on to the University. But Gemma's answer to the suggestion was “No daddy, the University is not for me.” And so it is that man proposes, but God disposes. I absolutely adore your website ... i have always wanted however, to buy a book of St. Gemma, which do you reccomend. Know that I am a discerning soul getting ready to join a convent, however, i would like to read as much as i can about saint for not all convents allow such openess to certain books, (ei Maria Valtorta). I have an interest to the book by Father Amedeo of St gemma, do you know how i can obtain a copy? Thank You. I am sure St Gemma watches over you and so is Christ for sharing the wonder he created for poor souls like us. Thank You again. Thanks for your kind comments. It is nice to meet you. I am glad to hear that you are going to enter the novitiate soon---may God guide and help you! Also I am glad to hear of your devotion to St Gemma--her love for Jesus was so extraordinary, don't you think? Father Amedeo's book is indeed excellent, and is quite popular in the original Italian, but in english it is the rarest one and is extremely difficult to find (it literally took me three years to find a copy of the english version). That is why I have published this entire book on my website here: "Blessed Gemma Galgani" by Father Amedeo, C.P. The other books on my list are relatively easy to find. And I know what you mean about having to be careful about what you read as convents do not allow all books--with good reason, of course. All the books on my list above are older books and I believe all of them have an imprimatur and nihl obstat, so they have the blessing of the Catholic church. Anyway, if you don't mind my asking, what religious order are you thinking about entering? Well, bye for now and may God bless you and your loved ones. It is nice to meet you as well. They are new, and i am convinced that it would be a contemplative life, it is just that i am not a simple person, like they require you to be with the Missionaries of Charity, and I am attracted to a contemplative life that isnt so cloistered. Well its a process, Gods time and our Time dont really coincide the way we desire most of the time. Thanks for your reply. I have not heard of the Trinitarians of Mary before however they seem to be very traditional, fervent and devout with adoration of the Blessed Sacrament etc.....I love that they wear the religious habit.--truly awesome! My best wishes on your spiritual journey and I pray that God may guide and help you in your vocation!